A television sign language interpreter has gone viral after her facial expressions perfectly summed up the 'perplexing f***ery' of Brexit. 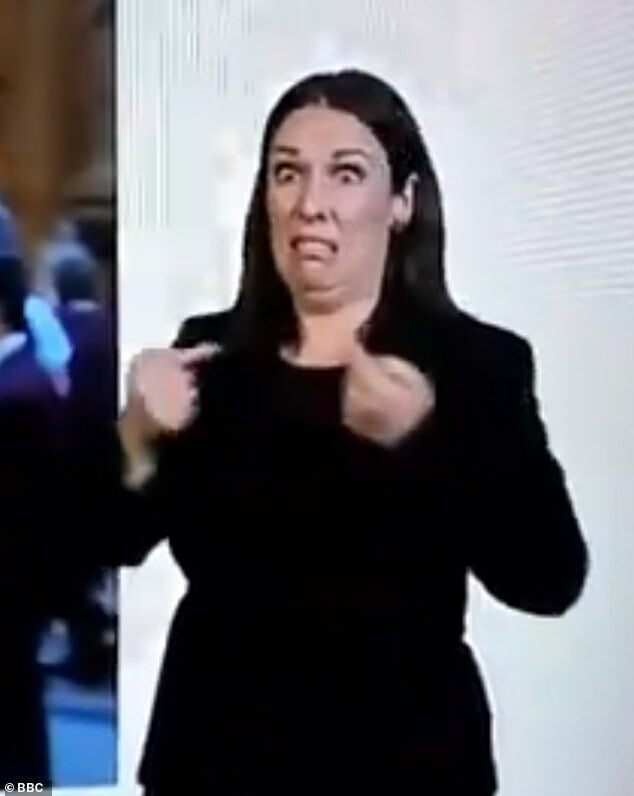 A hilarious video has emerged showing the sign language interpreter for BBC News displaying amazing facial expressions as she tries to translate what is going on in Brexit. The video was taken by actor and writer Ell Potter from London as she was watching the lunchtime broadcast on the BBC World News channel. She said: 'I was watching the BBC World News channel (I think it was BBC News at one) and the interpreter caught my eye as she was being so expressive. 'It seemed to me that it was the most accurate analysis of Brexit that I've seen today, and it didn't even need words -- she is just so expressive'. The interpreter can been seen pulling faces throughout the video as she interprets what has been a tumultuous day of Brexit. Ell, 22, saw her opportunity to take a video that she feels sums up the Brexit situation at the moment. She tweeted: 'The sign language interpreter doing the Brexit Agreement on BBC News is perfectly conveying the perplexing f***ery of this situation #Brexit #BrexitChaos'. The video was posted around 1:15pm today and has had over 113,000 views. The video shows the sign language interpreter doing her best to translate what is being said surrounding the Brexit Agreement. She steals the show as her facial expression perfectly describe the complexity of the Brexit fiasco happening today. The video has already been a huge hit with many people on social media. Billybirdshome said: 'I don't understand sign language, yet I know she's describing the goings on to a tee! The eyes have it!'. MarkBarrettCW added: 'Easily the best physical interpretation of brexit!'. SteampunkMuppet said: 'I'm in love. I need her to interpret all politics all the time'. Lima2001 added: 'Her expressions sum it up perfectly. #s*show'. Some people have even suggested she be given a new job. Ell was surprised by how many people have reacted to her Tweet. She said: 'I'm shocked by the amount of Retweets and favourites it has received. I'm glad that it's made people laugh as today is a bleak and tumultuous day'.